My husband and I have two friends we really love but the relationship does get a bit strained at this time of year: They’re Republicans. 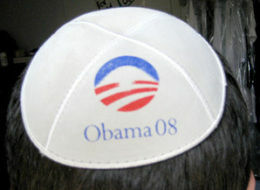 The last thing any of us need is this kind of thing: a Obamakah (or a McCippah). But others may be interested — if so, read about these political kippot here. This entry was posted in Uncategorized and tagged Current Affairs. Bookmark the permalink.